We are pretty excited for the second season of Sofia the First in our house. This is a show that is enjoyed by both of the kids equally. As an adult I am excited to hear many actors and actresses that I enjoy working on the show. There are a ton of them who are showing up to Enchancia to spend time with Sofia including Ginnifer Goodwin, Snow White from Once Upon a Time. And it looks like some of our favorite princesses will also be showing up to help Sofia when things get tough. I like that only a few princesses show up each season and I look forward to seeing which ones will appear. I really thought that a good fit would have been to have princess Merida appear in the episode where Sofia tried out for the flying horses race team episode. She would have been a good one to work with Sofia. I wonder when and if we will see her on the show. 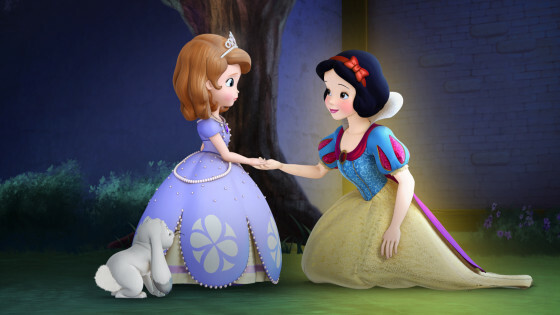 Season two of Disney Junior’s hit animated series “Sofia the First,” 2013’s #1 TV series among Girls 2-5 and the #2 cable TV series overall among Kids 2-5, debuts FRIDAY, MARCH 7 (9:30 a.m. ET/PT) on Disney Channel. A special episode featuring Snow White will premiere FRIDAY, APRIL 4 on Disney Channel (9:00 a.m. ET/PT) and Disney Junior (6:00 p.m. ET/PT). A preview of the episode will be available for verified users on WATCHDisneyJunior.com and the WATCH Disney Junior app for smartphones and tablets beginning Tuesday, March 25 and will become available on iTunes beginning Saturday, April 5. The new season includes appearances by Disney Princesses Mulan (voiced by Ming-Na Wen), Tiana (voiced by Disney Legend Anika Noni Rose) and Rapunzel (voiced by Mandy Moore). The guest voice cast for season two includes Alyson Hannigan (“How I Met Your Mother”) as a young faun who always felt she wasn’t special enough; Ginnifer Goodwin (“Once Upon A Time”) as the castle’s kitchen maid who aspires to be an inventor; Melissa Rauch (“The Big Bang Theory”) as Ruby’s fairy godmother; Anna Camp and John Michael Higgins (both of “Pitch Perfect”) as a charmingly sinister princess and a tall fire-breathing dragon; Isla Fisher (“The Great Gatsby”) and Sean Astin (“Lord of the Rings”) as two adventurous young sprites; Nick Offerman (“Parks and Recreation”) as a well-connected fox who reigns over Enchancia’s woodland creatures; Robert Morse (“Mad Men”) as an elderly retired sorcerer; Christian Borle (“Smash”) as an ambitious, young castle steward out to take Baileywick’s job; Oliver Platt (“The West Wing”) as a sickly old dragon; Tracey Ullman (“The Tracey Ullman Show”) as a happily wicked witch; and Phylicia Rashad (“The Cosby Show”) as a cranky ice witch who eventually allows her heart to be melted by the power of music. 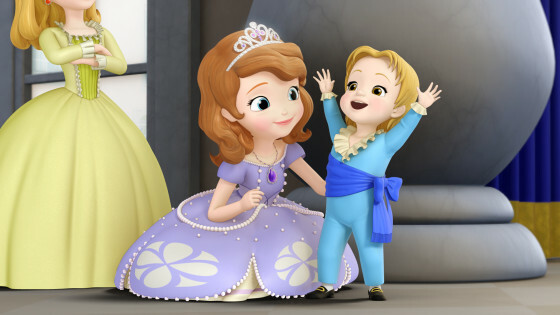 Created for kids 2-7 and their parents/caregivers, “Sofia the First” tells the story of an ordinary girl who becomes a princess and, throughout her journey, learns that possessing the characteristics of a true princess – honesty, loyalty, compassion and grace – is what makes one truly royal. The series stars the voices of Ariel Winter as Sofia, Sara Ramirez as Queen Miranda, Wayne Brady as Clover, Tim Gunn as Baileywick, Darcy Rose Byrnes as Amber, Zach Callison and Tyler Merna as James, Travis Willingham as King Roland II, and Jess Harnell as Cedric. Recurring guest stars include Eric Stonestreet, Ellie Kemper, Viola Davis and Bonnie Hunt. In the season two premiere episode, “Two Princesses and a Baby,” Amber asks royal sorcerer Cedric to cast a magic spell that will give her and twin James separate birthdays so that she can celebrate the day all by herself. After the spell accidentally turns James into a baby, Sofia helps Amber realize how special it is to have a twin, and then they work together to help Cedric reverse his spell. The episode features the songs “Sisters and Brothers” performed by Sofia and “Two By Two” performed by Amber. Then, in “The Enchanted Feast,” Snow White appears to help Sofia learn the importance of trusting one’s instincts after she suspects that a visiting sorceress is not who she says she is. Snow White is voiced by Katie Von Till and Megan Mullally (“Will and Grace”) recurs in the episode as Miss Nettle, an evil fairy who disguises herself as a powerful sorceress to attempt to steal Sofia’s magical amulet. 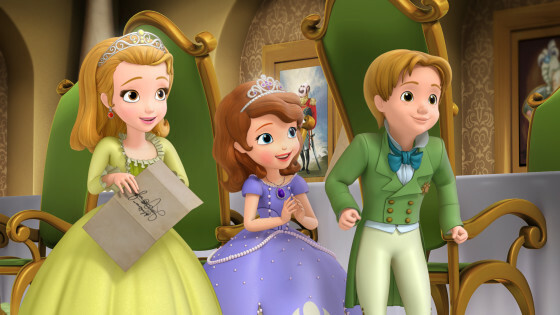 “Sofia the First” is executive-produced by Craig Gerber (“Pixie Hollow Games”) and Jamie Mitchell (“Special Agent Oso”), who also serve as story editor and director, respectively. John Kavanaugh (“Winnie the Pooh: Springtime with Roo”) serves as songwriter/music director and Kevin Kliesch (“Tangled Ever After”) is the composer. “Sofia the First” is a production of Disney Television Animation. Disney Junior reflects the emotional connection generations of consumers have to Disney storytelling and Disney characters, both classic and contemporary. It invites mom and dad to join their child in the Disney experience of magical, musical and heartfelt stories and characters, while incorporating specific learning and development themes designed for kids age 2-7. Disney Junior’s series blend Disney’s unparalleled storytelling and characters kids love deeply with learning, including early math, language skills, healthy eating and lifestyles, and social skills. In the U.S., Disney Junior is a daily programming block on Disney Channel and a 24-hour channel. There are 33 Disney Junior channels in 24 languages around the world.